What can we expect to see at WWDC this year? With WWDC right around the corner rumors are running high with news about new iMacs, MacBook Airs, and more. 1. With Intel’s new Ivy-bridge processors out, and Apple’s whole computer line-up awaiting an update we can will definitely predict that Apple’s new machines will definitely carry the Ivy-Bridge Chips. 3. More RAM: Currently the most RAM an Apple Macbook can hold is 8 GB, but rumors are showing MacBook Pro models with up to 16 Gigs of RAM. Now that would be one monster laptop. 4. Apple’s top-of-the line Mac, the Mac Pro, has not been updated for 2 years. And sources are showing a scarcity in Mac Pro’s at Apple Stores. Professional workers would love to see a new Mac Pro, so hopefully we will see an update next week. 6. Retina Display Macs: Display technology has become more and more advanced. And some images found in the source code of Mountain Lion show images with a large number of pixels that would only fit on a Retina Display. 6. iOS 6: Pictures below show that Apple will be showing iOS 6 off and most probably release developer versions. Some features we might see in iOS 6 are Facebook sharing integrated into Apps, Siri for the iPad, Apple’s new Maps app, and iCloud improvements. 7. Mountain Lion: Versions of Mountain Lion have already been seeded out to Developers so we can probably hope to see Apple release Mountain Lion to the public at WWDC. 8. Apple TV SDK: Sales of the Apple TV has been steadily increasing and at AllThing’s D’s D12 conference Tim Cook stated that the Apple TV had become something Apple would pay more attention to. So we might see Apple release an Apple TV SDK, so the Apple TV can become a more attractive offer to people. All of this seems like too much to be releases at one WWDC keynote, but these are just predictions that may or may not come true. If you have upgraded to Lion? 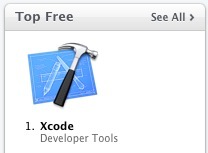 Then you might have noticed that in the Mac App Store Xcode is now Free, instead of the original $4.99. Before only paid developers could get the newest version of Xcode. Otherwise if the public wants to use Apple’s Developer Tools they can only get the previous version of the tools. But now it’s free. Because of the 100% Price Drop, it has become #1 on the Top Free List (as of July 24th). When you download Xcode from the Mac App Store, it all so includes the iOS SDK‘s, Mac SDK’s and other Dev Tool like Interface Builder and Instruments. So you get everything you need to build and iOS or Mac App, except you need to pay to submit it in to the App Store. However you will not be able to get certain things like iOS Beta’s, OS X Gold-Masters, Xcode Beta’s, etc. Those are still reserved for Paid Developers. Xcode and the rest of the tools are great for programming, even for beginners. I am learning the Programming Language Objective – C and I only use Xcode. So for any of you who are interested in writing an App for any of Apple Platforms I advise you to download to Xcode. But beware it’s a huge download like Lion, so it will take a long time. Please Rate, Comment, and Subscribe. Evernote is known for it’s amazing note-taking application on the Mac and iOS Devices. Now they have come up with this new Application for the iPad 2 called Evernote Peek. The Smart Cover was Apple’s cover accessory for the iPad 2. One interesting feature of the Smart Cover working with the iPad was that when you opened the cover, the screen would automatically on and would off when you closed it. So with Evernote Peek you load questions into the App, then you close the Smart Cover. To start you open the first flap of the Smart Cover to reveal the question. You answer it then you open the second flap to see if your answer was correct. Then you close it so it can pick another questions. That’s how it works. It’s so amazingly simple yet it’s the first Application that uses the Smart Cover. Apple on Monday announced iCloud this Monday which let’s you keep your media in sync between your devices. But what if you have songs that were not bought on the iTunes Store? How will they be uploaded to iCloud? Apple has come out with a product called iTunes Match. What this does is, is it tries to match your songs with the 18 Million Songs on iTunes. And if it’s found iTunes will automatically upload the song to iCloud at 256 Kbps quality, even if your original song was of lower quality. However if your song is not in iTunes it let’s you upload that song to iCloud. Apple will release this service in Fall along with iCloud and iOS 5. But unlike iCloud iTunes Match will cost $25 Annually. I wonder if Apple will let you upload your songs to iCloud even with out iTunes Match because from my entire iTunes Library only one song was bought from iTunes. Great Job to all the winners. They are also lucky to get free advertising from the Media that give free coverage on these apps. At WWDC 2011 Steve Jobs showed to the world what iCloud was. He began with saying how 10yrs. ago people realized that the computer would become a “personal hub”, it would be where you would keep all your media. So before to get photos, music, videos, etc on your devices they had to be synced wit your Mac. But nowadays every the devices hold all types of media, and it was hard to make sure that all your devices had the media you wanted when you wanted it. So now the Mac is also going to become a device and the “personal hub” will be moved to the cloud. And Apple’s cloud will be iCloud and it will store information and push information to all your devices to maintain in sync. And it will happen seamlessly without you having to do anything. So for example you download a song on your iPad it will automatically download on your Mac, PC or any other iOS device for free. Then Steve jokes,”Why should I believe them? They’re the ones that brought me MobileMe.” Because MobileMe wasn’t much of a success. But MobileMe had three major apps Contacts, Calender, and Mail. And now Apple has rewritten those Apps from the ground up for iCloud. Contacts: Now when a contact is made on an iPhone, the contact is pushed to the Cloud and then to the other devices. So every device attached to your Apple ID will have their contacts synced automatically. Calenders: Same for Calenders, you make a new event or update an event on one device it is pushed to all your other devices automatically. You can even share calenders between devices. Mail: And again you messages, inbox, folders, settings, are all synced between all your accounts at your me.com email account. App Store: On all your devices you can view a purchase history, even if the app is not installed on your current device. But since all those Apps are synced to the cloud, you tab a button that will let you download that App onto your device from the cloud for free. iBooks: Like the App Store you can view your purchase history, and it is all saved on the cloud so your books will automatically download to all your devices for free. Wireless Backup: Once a day iCloud will automatically back up your device. it backs up everything including settings, music, photos, apps, books, and other information. So if you have to restore your device or you get a new one, the backup will automatically sync the device. Documents in the Cloud: When you use iWork on one of your devices and create a document, the document is sent to iCloud and then pushed to all your other devices. So this works with Keynote, Pages, and Numbers. And also developers get API’s to put this system into their apps for iCloud integration. And this works with Macs and PCs. Photo Stream: So you can take a Photo on your iPhone and then be able to watch on your iPad, iPod Touch, Mac, PC, and Apple TV.. Also if you import photos on to one device it will be sent directly to all your other devices. To sync with a Mac it will send the photos to iPhoto and for PC with the Pictures Folder. And to save storage space Photo Stream it will only store the 1,000 most recent photos and for only 30 Days in the iCloud Server. To keep a photo permanently all you have to do is save it to an Album. iTunes in the Cloud: So same as before buy a song, podcast, movie, tv show on one device and the purchase history is saved in the iCloud. So go to any other device and tap to download the same media for free onto that device straight from iCloud. Or as an option you can have it automatically download all purchased content on all of your devices. Phil Schiller and Craig Federighi show off Lion at WWDC ’11! The first major thing demoed by Apple today was Lion. Lion has around 250 Features, but only 10 major ones were demoed today. First Mr. Schiller explained Multi-Touch gestures, Full Screen Apps, & Mission Control. Then Mr. Federighi came up and demoed these new features. Multi-Touch Gestures: In Lion the gestures are improved and are more fluid. It brings many gestures from iOS to Lion, such as tap-to-zoom, and even new ones like swiping between full-screen apps. Full Screen Apps: Almost all of Apple’s Apps are designed to be also used in Full Screen completely blocking the Dock and Menu Bar so like in iOS the only thing you see is the App you are using. And using three fingers and swiping to the left you can switch between Full-Screen Apps. Also one full-screen App, Photo-Booth has a new interface and new animations such as face detection where birds will fly in a circle around your head or make your eyes look BIG and many more. Mission Control: Mission Control is new feature that combines Expose, Spaces, Dashboard, and new features all into one seamless experience. Slide 3-fingers up and it will show you all your windows open, clustered by App, and it will show you all the desktops open. Also while in Mission Control you can make or delete desktops and move windows in and out of desktops. Also there is a whole desktop preserved for Dashboard widgets. Then Mr. Schiller talked about the Mac App Store,Launchpad, Resume, and more. And again Mr. Federighi came up and demoed those features. Mac App Store: Since the Mac App Store was release for Snow Leopard, it has been a great success for Mac App developers. For example AutoDesk is on the Mac App Store and added more than a million users, just because of the Mac App Store. And with Lion there are new features such as in-app purchases, sandbox security feature, push notifications, and faster updates. Launchpad: With a four-finger pinch gesture they can view all their applications in an iOS type UI. When you download an App from the Mac App Store it will show directly in Launchpad. In Launchpad you can launch an App, create pages of Apps, and like in iOS create Folders to put Apps in. Resume: This feature saves whatever you are doing. So when you open an application it will open right where you left it. If you had to restart your computer it will open up all the windows when it starts back up. Auto Save: When you’re working on a document it will automatically save what you are doing. So if you did something wrong and want to go back to what you had done before you can go directly to it. Or you can make instant duplicates and lock the document so it can’t get tampered with. Versions: Auto Save will continuously save the changes you make in a document. You can choose to view all your versions and get a Time Machine like UI to see all the versions of the document. Air Drop: In the Finder Menu you can select the Air Drop menu and view all the people on your network running Air Drop. Using this you can seamlessly send documents back and forth between Macs. Mail: In the new Mail you can have a two or three column view, with the UI similar to the iPad. Also Mail has new ways to filter responses during searches. Another thing is called Conversation View. In this view each message is split into different sections to not confuse everything to one section. Those were the 10 main features, but there are many more including Windows Migration, FileVault 2, and more. And for developers there are more than 3000 new API’s. Another change to line is than instead of an Optical Disk like its previous cousins, Mac OS Lion will ship only through the Mac App Store. All you gave to do is click “Buy” and it will do all the upgrades needed automatically. Lion will only be 4GB. And the Price? Apple has decided to sell Lion for only $29.99. The most-recent developer preview will be available today. It will be available for customers in July. The Server Version will only be $49.99. For me I think that Snow Leopard to Lion is a major jump compared to Leopard to Snow Leopard. I can predict that apple will bring more iOS features to OS X in the future. Hey Guys I couldn’t find a stream for my self, but these lucky guys have a video blog, with an Audio Feed. Have Fun! If I find a safe website by 9:00 AM Monday morning to stream the WWDC Keynote Address then I will be able to maintain a full live-blog for everybody to see to get the scoop on iOS 5, Lion, and iCloud. Special thanks to Cover-it-Live for building this live-blog for me. PS: If anybody has any suggestions on where to stream the keynote from, it would be great help!